Ideal for general storage of dry or liquid materials. Closed head pail includes a metal flex spout, while the open head pail has plastic flex spout. 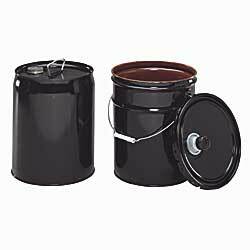 Choose from phenolic-lined (P) pails for extra chemical resistance or pails lined with rust inhibitors (RI) for general use. 5-gallon capacity. Sold in quantities of four.